Foxmail is a compact, yet very powerful email program with many useful features and a pleasant interface. It supports POP3 accounts as well as Hotmail accounts and offers support for HTML email, multiple accounts, mailbox encryption and more. It also comes with a WYSIWIG tool to compose nice looking HTML emails from templates or scratch. The program also offers filter options, allowing you to act upon incoming mail that meets certain criteria - you can delete messages, forward them, auto-respond to them and more based on keywords appearing in the subject, address, text etc. The Express Send feature enables you to send mail directly to the recipient, using the built in SMTP server, thereby bypassing your ISP. 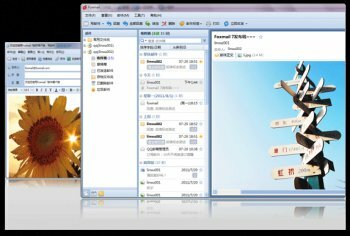 It includes many other features, including a remote mail viewer to manage mail on the server, as well as a small scroll ticker that displays message subjects as they arrive in your inbox. - Filters manager window is not resizable (with lot of rules it gets clumsy). Installation dialogs for this are in Chinese, so it's impossible to install. Might give it another shot if they ever get round to releasing an English version. I'm sticking with Foxmail 7.0! With 7.2 you can't customize several annoyances. 1) The mail list is grouped by date and you can't ungroup it. 2) There's no way to change the font of the view or preview panes, nor the background color. 3) When viewing the RSS list without a preview pane, or with preview on bottom, the titles in the list don't show at all. With RSS feeds I would also like to be able to search them. But this is missing in all versions of Foxmail. I use foxmail because all other email clients consume huge resources, including most browsers. Since I use IMAP, I just want a simple, small, program. Foxmail is the closest I can find. I love the fact that I can run it on a portable drive without installing it on each operating system I use. If anyone knows of a good gmail contacts syncing program for Windows let us know! Just upgraded from version 7.1 (which seems to have some issues) to 7.2. Very pleased with the new version. I have been using Foxmail for many years and it has never let me down. To get the English menu had to delete the Chinese lgb files. Importing all data from old version worked perfectly. It is recommended to do a clean install instead of upgrading you can import all the mails, filters, labels, signatures, templates etc from the previous version (some copy and paste is required for some items like Labels. Version 7.2 with a clean install is using only have as much space as a upgrade. It also works perfectly on a USB stick or portable drive. I can not understand the comments from Hilbert. Why do you want to install a mail program if you don't have a e-mail account. There is Hotmail, Yahoo, Gmail and many more free mail programs. Sign up with one of them and install your Foxmail, as simple as that. I have been using Eudora, Pegasus, Outlook, Becky, Thunderbird and many more and Foxmail is the best in all aspects. There's no off-line installer or obvious way to setup an account off-line, so the program is essentially useless in deployment terms. Moreover, FoxMail WON'T EVEN START unless there's an account--no access to the server, the internet down etc. and you're truly stuffed. Nor, seemingly, is there a pre-configurable .ini file or such that a user can edit beforehand. The programmer of this email program really is an imbecile, as he's not even thought the basic operational logic through before he's started programing! If the programmer ever reads this then I suggest he downloads an ancient copy of Eudora mail, (v 7.1.0.9 is still downloadable) and examine how eudora.ini works! Essentially, there's multiple ways of creating accounts off-line (which one often has to do in corporate environments). Looks nice, I installed it but like someone else said I cant read that language. Pretty good, just cannot find a way to use other spell checker dictionaries besides American. Anyone knows if there's a way to set up that? 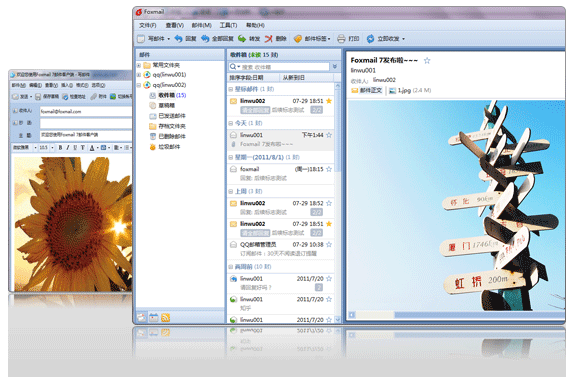 1.If you import the mail accounts from a previous version then the "In Box" will be displayed in Chinese characters. You can solve this problem by creating a new account with the same name and move the mails from the imported account to the new account and the delete the imported account. 2. Unfortunately in Signature Manager you can no longer embed a link in a picture as in the previous version. 3.Templates can not be sorted for forwarding, replying and compose anymore as in the previous version. They just will be sorted alphabetically. 4. There is no Tool Bottom for Receive Current Account and Receive All. There are a lot of new features and the program is extremely fast and uses very few memory. A very good e-mail client and I just hope the few shortcomings as listed above will be implemented again. Very good mail proggy. Get the 7.0 version from the chinese website. Memory usage of the 7 version is unbelievably low. It uses 24K on my system. Amazing.